I'm no stranger to mobile games or apps featuring unlicensed famous characters. They're usually cheap click bait fodder aiming to make a few bucks off ads. However, hidden in the Google Play store is a charming little series of platformers that are made with 100% love. 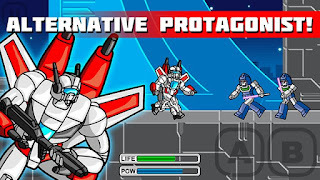 Robot Warfare is a free game series made by a fan who has managed to make fun mobile gaming experiences with our favorite robots from Cybertron. Gameplay centers around working your way through a stage full of platforms and Decepticons. 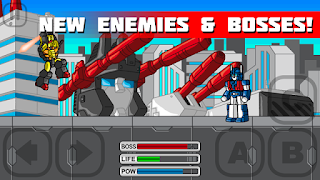 Impressively enough, each game offers a variety of characters to play including G2 Laser Optimus Prime (DUDE!). The games look great on my 7 inch Galaxy, so I can only imagine they'd look great on a phone. Bright colors and a variety of on-screen characters add to the challenging (but not cuss and fling your tablet across the house hard) gameplay. Considering the price (free), you have nothing to loose trying these out. So trust me, they're great and have more heart than some official offerings. There's even a GI JOE game! I'd make a joke about these tablet games have the touch, but I'd like readers to come back. Went away for a while, realized I missed out on some of your posts, came back and started with this one...and I am so glad...I'm going to have to find them! Thanks!